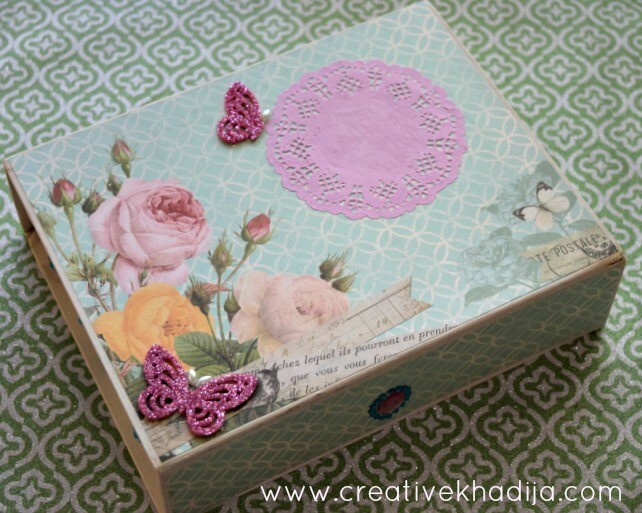 Hello Creative friends, I am going to share a recycled miniature project today. I made a match box drawer with three empty match boxes. I have shared so many recycling & upcycling projects & this one is probably the smallest one recycled craft. 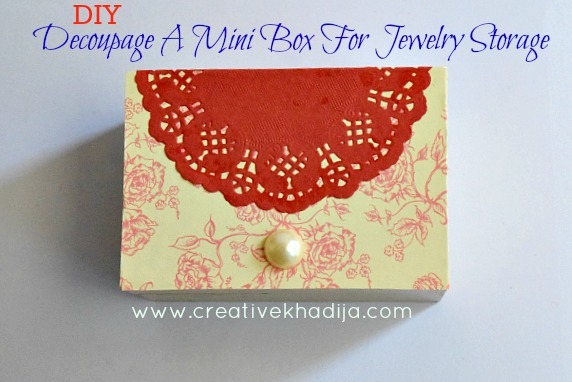 I am always looking for organizers where I can put my tiny goodies related crafting. I have some rhinestones of different sizes which I were saving in a jar but I saw this idea on pinterest & got inspired to make one. That was a 4 matchbox drawer with fabric cover coating. I liked that & thought to make one tiny drawer for my scattered rhinestones collection. So have a look what I have made. In these three drawers I have saved many rhinestones & beads. It’s simple, quick & easy recycling idea. See the making now! 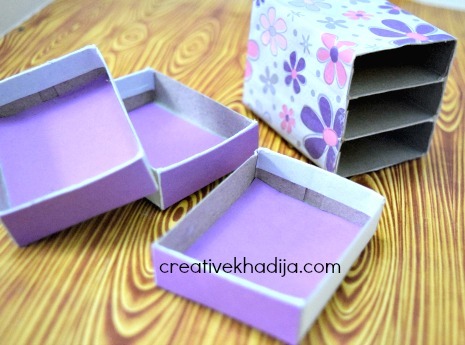 Cut some purple paper strips as drawer liners & front covering. Wrap the colorful sheet around & let it dry. 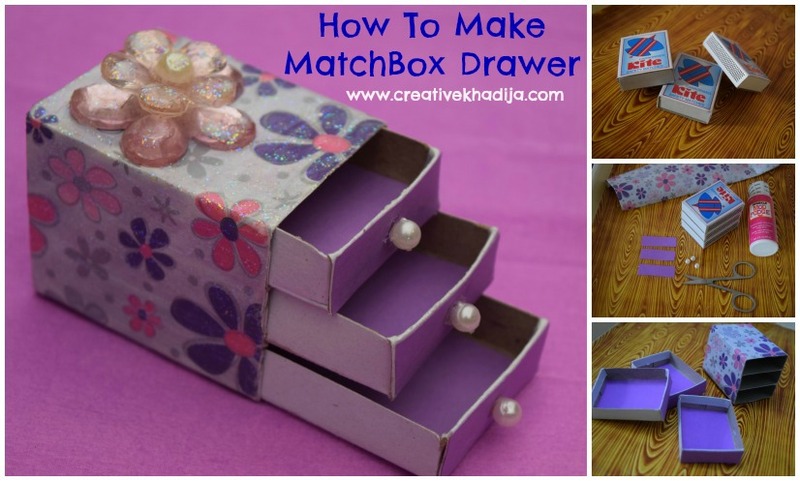 Put a card sheet at the back end of the matchboxes drawer. Do not paste that. Otherwise your drawers will stick there & will not be opening. 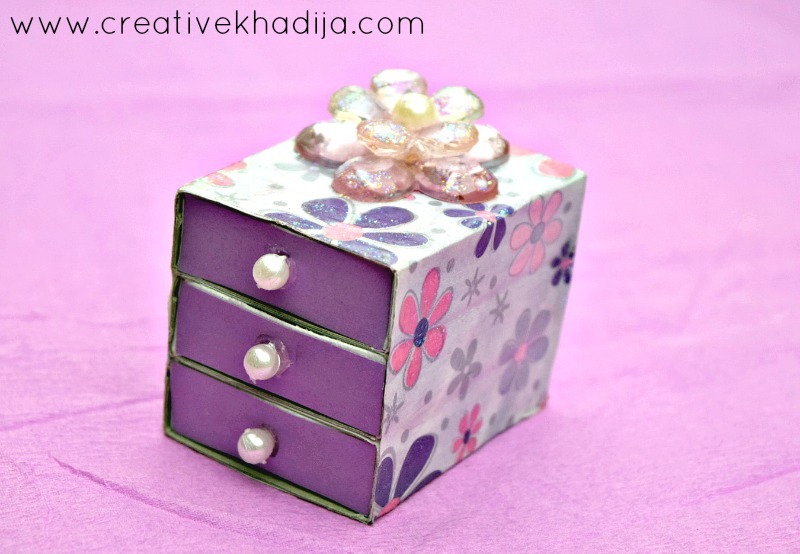 With hot glue, Paste the small pearl beads as drawer knobs. Fix the bigger plastic flower on top of the drawer & you are done! 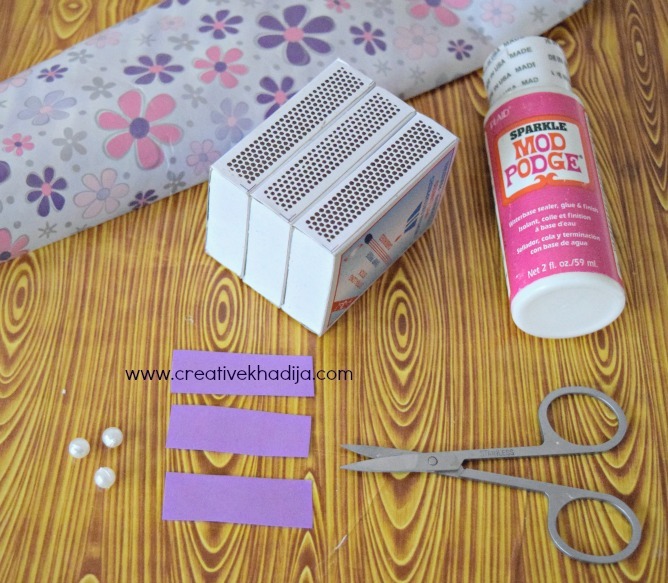 Seal it with mod podge sparkle & let it dry! 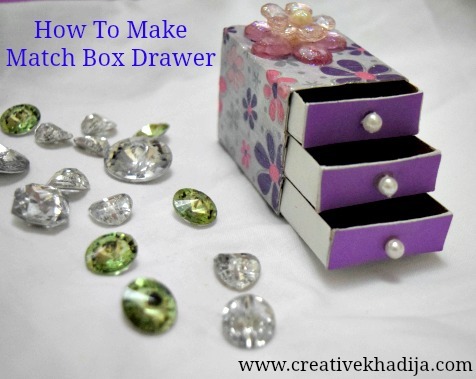 You are done making a small drawer for any jewelry, beads, rhinestones or anything smaller in size which usually makes a mess in your drawer! 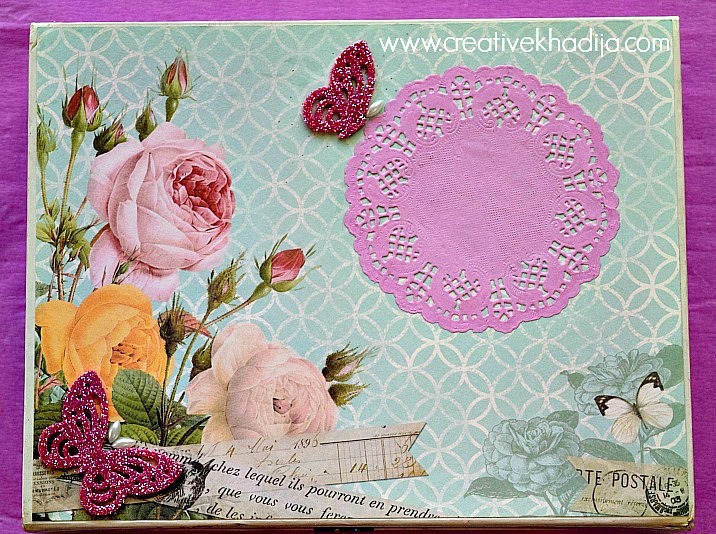 You can Share this collage tutorial on your social media networks. This is one easy yet useful recycling idea. No more small clutter will be missing anywhere. 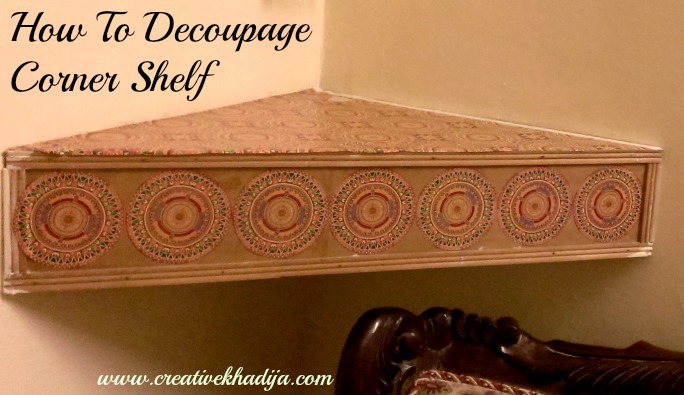 This is so easy & fun way to decoupage. 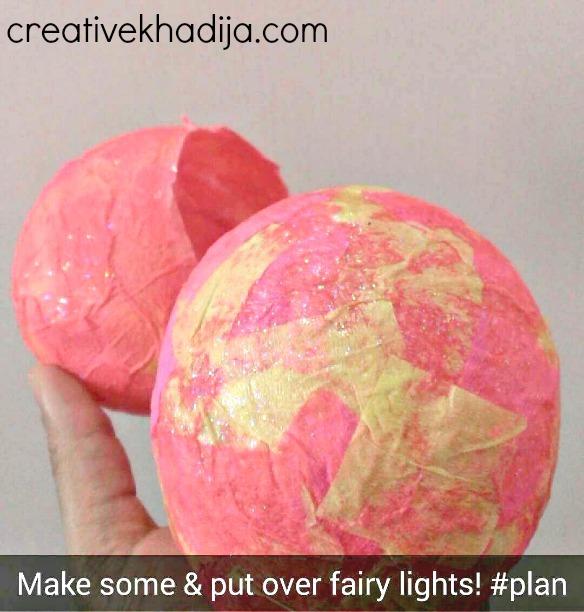 Creative kids crafts idea. Isn’t it? 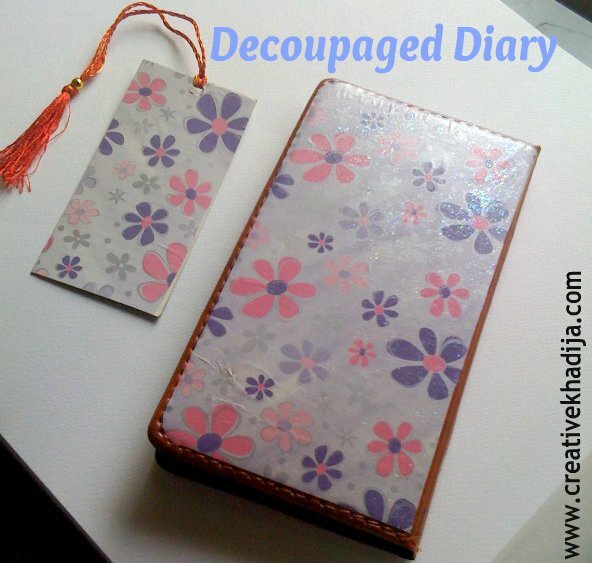 You might remember that decoupage diary which I design with the same wrapping paper sheet. 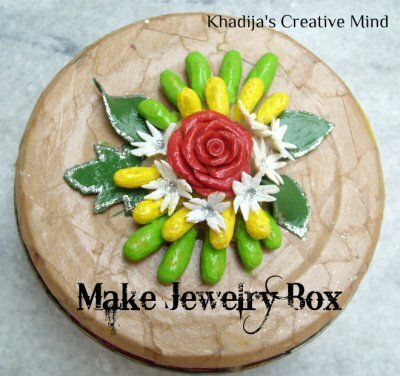 I made this Decoupaged Jewelry Box, Enjoy it’s tutorial. You can have a look at my previous recycling ideas & crafts. What a fantastic little project! Definitely one that I want to be trying soon! Thank you Shannon for enjoying the idea :) sure, give it a try! Thanks Pita. I am glad you liked it. This is so cute and can be so useful. Indeed. Its super easy and perfect for kids crafting! I love decoupage! Some really cute ideas! Thank you for sharing and linking up at Dishing It & Digging It :) We enjoy having you! Thank You Anita. I am glad you liked it. Sure Joanne, Give it a try! I am sure you will like it. A tiny little treasure for sure! Thanks for sharing with SYC. The cutest thing EVER! reminded me of my childhood! 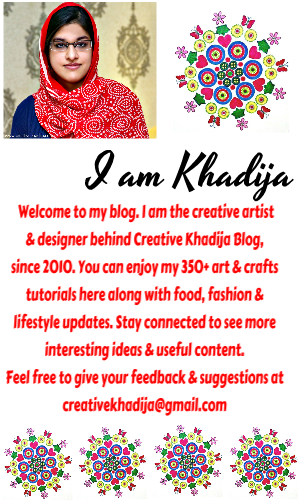 Thanks Maliha for enjoying the article. That is a great idea. I like having using candles so I have plenty of matchboxes and those drawers look adorable. I will definitely be pinning this tutorial. Thanks Rebecca, I am glad you liked this idea & pinned :) So sweet. Up-cycling & reusing stuff is simply fun! No worries if there is a fail :) Thanks for appreciating! As a small child many years ag0, We used to make arm chairs and other furniture. 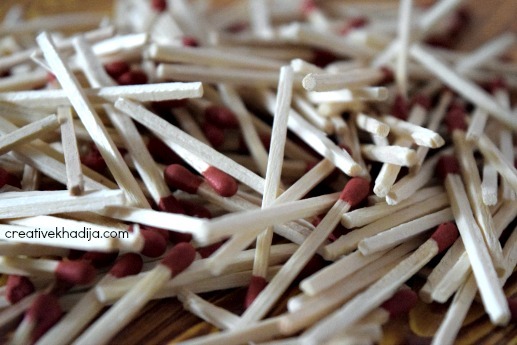 In those days most households used matches to light the gas every time we wanted a cup of tea so there were plenty of boxes to be had in quite a short time. So cute! Perfect for storing little trinkets or even small gifts. I’m betting my daughter is going to want one when she sees this. Thank you for sharing at The Really Crafty Link Party this week. Pinned! I made a few of these for my doll house back in the day. Cute.